Don't waste any more time and start using our amazing and creative Christmas holiday season mockups! 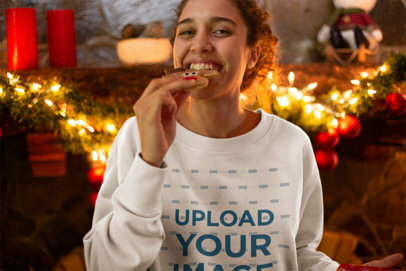 Like this Xmas T-Shirt mockup featured by this beautiful smiling woman eating a gingerbread man with a fun and cool attitude! Our mockups are super easy to use! All you have to do is import your image and we'll do the rest! Try out our Christmas season mockups to showcase all your newest clothing designs in a photorealistic manner. All our mockups are fully customizable in cost and effort effectiveness. 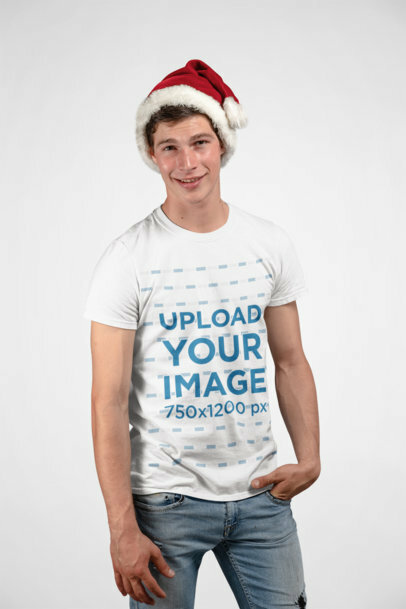 Try this cool mockup featuring a smiling man wearing a Santa hat and a custom t-shirt; it makes the perfect casual look scenario for your Christmas designs. Its simplicity makes this t-shirt mockup ready to be promoted on any website! Isn't this mockup super cute? It features a beautiful woman with her dog, they're surrounded by Xmas ornaments. She's wearing a pullover hoodie and you can even change its color. Promote your Christmas designs now! What are you waiting for? Edit your mockup now. 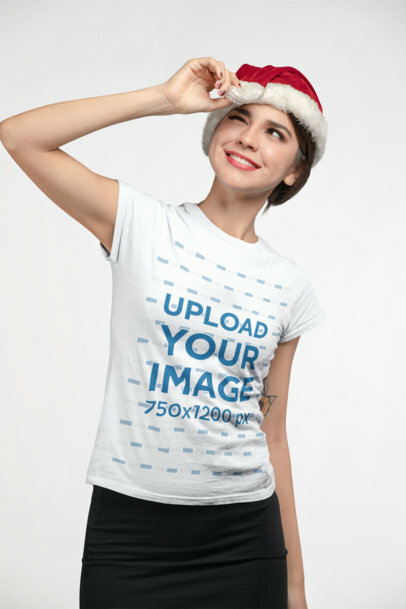 Use this Christmas season holiday t-shirt mockup as your latest addition to your marketing tools and leave a lasting impression on potential costumers at a glance! 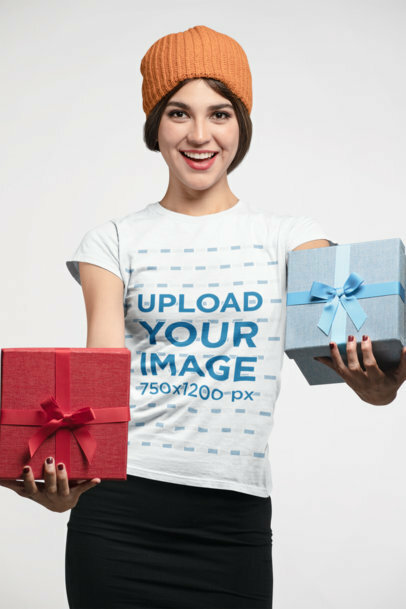 This casual and cool t-shirt mockup of a beautiful woman holding a candy cane is perfect for showcasing your newest Xmas tee design for enticing your clients! Get ready for Christmas with Placeit's apparel mockups. Our mockups are fashionable, trendy and full of the Holiday Joy. This one features a woman holding a large beautiful gift. It's perfect for Christmas! Our mockups are super easy to use and don't require any additional software. Try it out, it's awesome! Edit your Christmas Mockup now. Can't picture your favorite design on an actual t-shirt? No need! 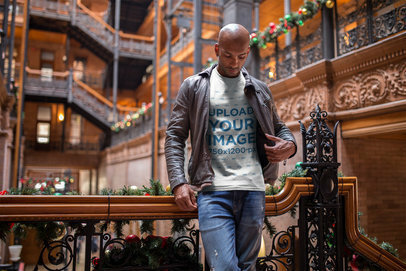 With Placeit you can literally just place your custom t-shirt design on our amazing mockups created just for you! 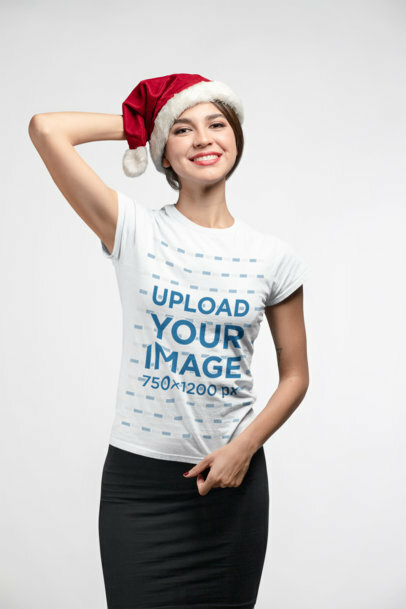 Stop stalling expensive software and take advantage of this beautiful Christmas t-shirt mockup featuring a smiling woman with a Santa hat. The background and the tee are completely customizable! Try it now and just have fun with it! Create gorgeous visuals for your ugly Christmas sweater designs with Placeit! This amazing mockup is an excellent choice if you are looking to promote three of your sweater designs that were made for the Christmas Season. Start now using beautiful images such as this to show your X-Mas sweater designs and make your sales grow with high-quality visuals! 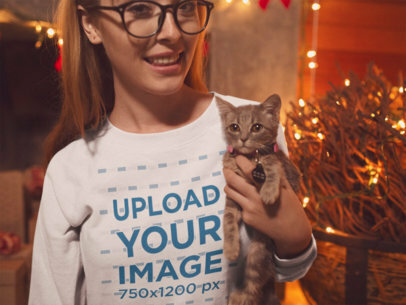 Create awesome visuals to promote your latest ugly Christmas sweater designs with Placeit! This awesome visual is an excellent choice for you to showcase three different designs for your xmas sweaters. 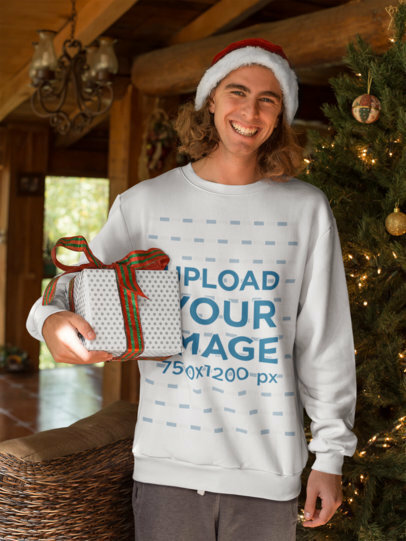 Use Placeit now and make your revenue grow in Christmas by selling more ugly xmas sweaters. 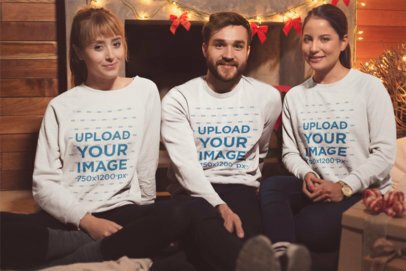 Create awesome visuals with Placeit's mockups for your latest xmas sweater designs and make your revenue grow after using mockups that will show a more realistic version of your designs. Start now putting your design on our beautiful visual assets and promote your ugly xmas sweaters! 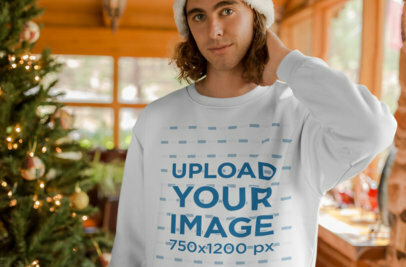 Edit your Christmas Sweater mockup with Placeit! We create apparel mockups that shine, stand out and promote your images in the best way possible. This mockup features a beautiful smiling girl holding her Christmas present, she's surrounded by Xmas ornaments and she's wearing a Christmas Sweater. You can even change her sweater's color. Try it out, it's easy! Spread the Holiday Joy with Placeit's Christmas Mockups! Our mockups are easy to use, professional, and don't require any additional software or downloads. This one features a woman wearing an ugly Christmas sweater. You can even change the sweater's color. Awesome, right? Edit your Christmas mockup now. 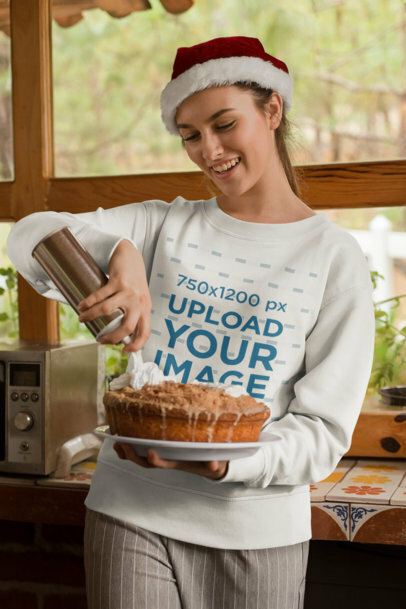 Create beautiful visuals to promote your latest designs for Christmas sweaters with Placeit and see how your sales grow after displaying your ugly x-mas sweater designs with an enticing image that will totally transmit the Christmas spirit! Christmas is just around the corner and here at Placeit, we're sure you'll love our new Xmas Mockup seasonal designs we created just for you. Like this one, which features a gorgeous white model smiling and holding her Santa hat taken at a studio! It's fun, it's perfect for promoting your newest T-Shirt designs, and it's completely customizable! What else could you ask for? Give it a go, here at Placeit. Get ready for the Holiday Season with Placeit! Got a cool sweater design you want to use for Christmas? Promote it with our Holiday Mockups. This one features a smiling man celebrating Xmas. Super cool, right? The best part of all, they're super easy to use. Try it out! Placeit makes amazing mockups perfect to promote your clothing line for the Christmas Season. Try this one featuring a happy woman with a sparkler celebrating Christmas at home. Customize the Sweater with your designs, you can even change the color! What are you waiting for? Edit your Christmas Sweater Mockup now. Promote your amazing designs with Placeit's Xmas Mockups. Our mockups are easy to use and help your designs set a mood and shine! This mockup features a beautiful couple celebrating Christmas. You can even change their ugly Xmas Sweaters' color. Edit your Christmas Sweater mockup now. 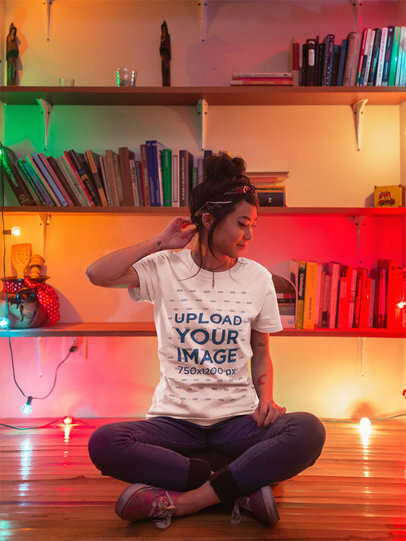 Use this beautiful mockup featuring a girl sitting next to christmas lights and bookshelves and promote your latest designs for round neck tees in a more beautiful and realistic way! 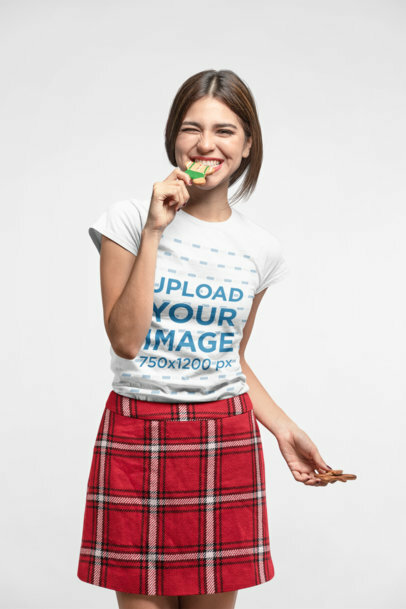 You just have to choose a color for her tee using the HEX tool on the right, then drag-and-drop your jpeg or png image file over the upload button on the left. Simple, wasn't it? Try another T-Shirt Mockup! It's Christmas time! 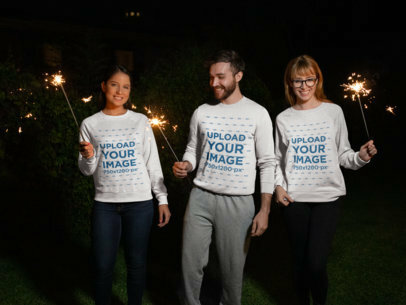 Try out at Placeit your Christmas sweatshirts on this amazing mockup featuring three happy friends. It's an ideal option to add the perfect Christmas vibe to your clothing brand website or marketing campaign. Customize our mockup and make everyone want your Christmas sweatshirts now! Promote your designs just in time for Christmas! Placeit creates amazing mockups perfect for anyone. 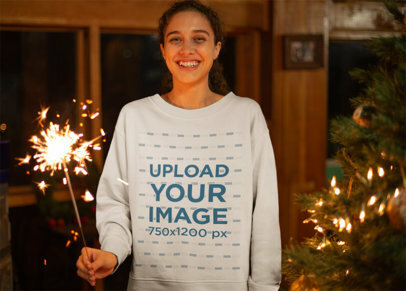 This mockup features a pretty woman with a sparkler celebrating Christmas. You can even change her sweatshirt color. Cool, right? Edit your Christmas Mockup now. Promote your beautiful Christmas designs with Placeit! Placeit's apparel mockups are on trend, beautiful and professional. Like this one featuring a cute couple on Christmas underneath the mistletoe. Beautiful, right? Try it out, it's easy! Edit your Christmas Mockup now. Spread that Xmas joy! Placeit has amazing mockups perfect for the Christmas Season. Like this one featuring a beautiful couple under some mistletoe. They're wearing hoodies and you can even change their color! Your design will stand out and shine! What are you waiting for? Edit your Xmas Mockup now. Placeit's has all the Christmas Mockups you need! Start promoting your designs with our awesome apparel mockups. Like this one featuring a Woman decorating a pie. It's super festive and lovely. You can even change her sweatshirt's color. Try it out, it's easy and fast. Edit your Christmas Mockup now. Spread the Christmas Cheer with Placeit! Start promoting your designs in an awesome and cheerful way. Placeit creates mockups that are on trend, fashionable and cool. Like this mockup featuring three friends celebrating Christmas. Your designs can go on all 3 sweatshirts! Cool, right? Try it out, it's easy. You can even change their sweatshirt's color. 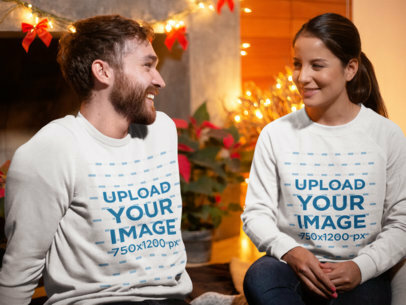 Spread the Christmas spirit using Placeit's mockups, this one is a great choice to market your ugly Christmas sweater designs, specially if they're meant for a couple! 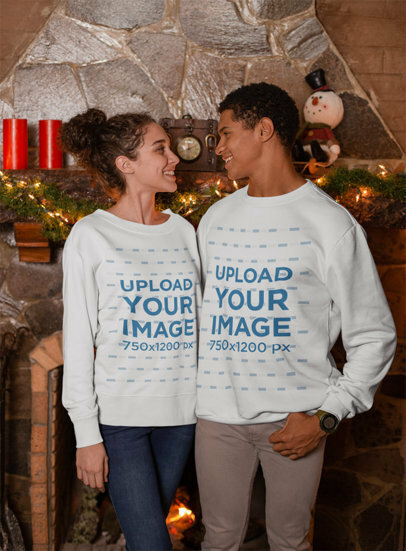 Use this gorgeous image of a couple and show a more realistic version of your ugly sweater designs with Placeit's Christmas mockups. Joy surrounds this cheerful mockup in which a woman holds Christmas holiday gift boxes! At Placeit we have the best customizable mockups for every occasion to spark your audience's attention and showcase your latest designs! What are you waiting for? Make Placeit's clothing mockups the latest addition to your everyday use of marketing tools. Spread the Christmas Cheer with Placeit's Apparel Mockups. Placeit creates beautiful Holiday mockups perfect for your designs. They're easy to use and don't require any additional software. Like this one featuring a happy woman eating a Christmas cookie. Pretty, right? Edit your Christmas Mockup now. 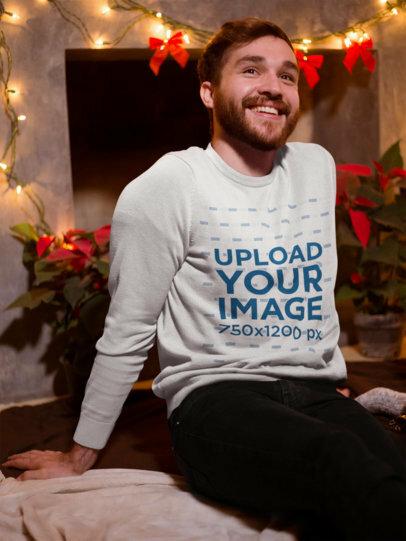 Create awesome visuals to promote your latest ugly X-Mas sweater design with Placeit's mockups, they're a great choice to display your designs using a more photorealistic visual. 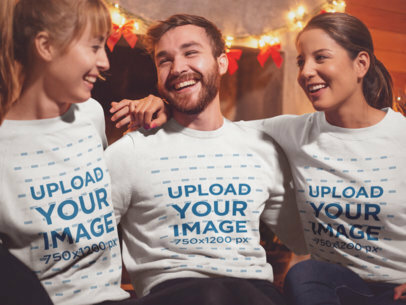 Showing your audience a more realistic image with your ugly Christmas sweater being worn is a great choice if you want to make them picture how your design will look like in real life. Spread the Christmas Joy with Placeit! We create beautiful apparel mockups perfect for the Holiday Season. This mockup features a man sitting in front of the chimney on Christmas. Your design will shine above the competition. Try it out, it's super easy to use. Edit your Christmas Mockup now! Promote your Christmas Sweaters with a handsome model wearing a Santa hat! Try your latest Christmas sweater designs without spending much time, our clothing mockups are completely customizable and easy to use. This mockup will be an amazing asset for an effective Christmas campaign! Try it out! 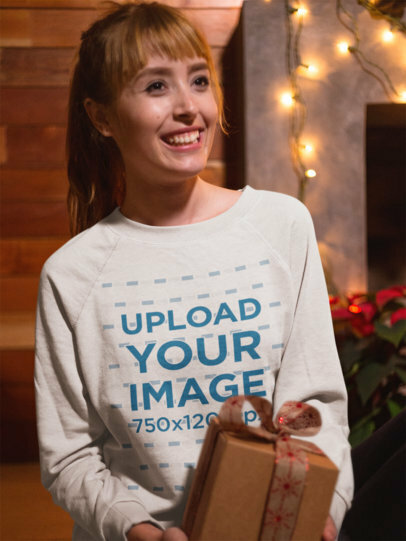 Create an effective marketing campaign to promote your ugly Xmas sweaters with a Christmas mockup from Placeit! 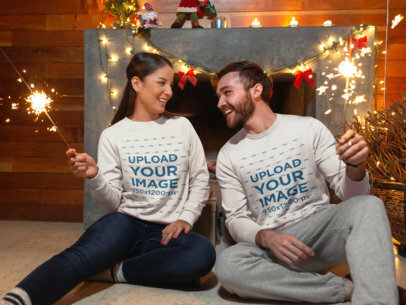 This mockup featuring a happy couple wearing sweaters while holding sparkles will look amazing with your designs. 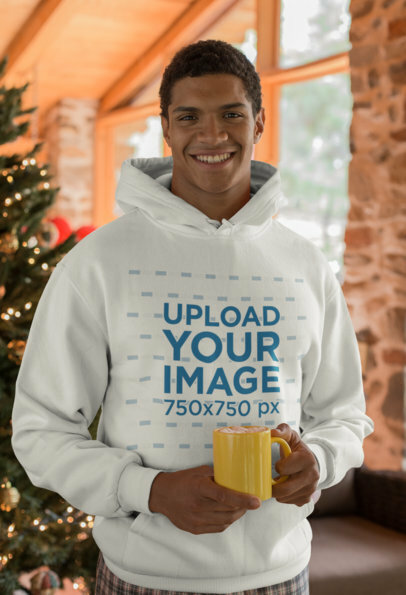 Change the sweatshirt color, add your Christmas design and your mockup will be ready to be advertised! Edit your Christmas Mockup and start promoting your designs! Placeit creates fashionable, professional and fun mockups perfect for the Holiday Season. This one features a woman wearing an Xmas Sweater. You can even change her sweater's color. Try it out, it's easy. Celebrate Christmas and promote your amazing designs at the same time. This joyful Christmas Mockup features a beautiful woman standing in front of a Christmas Tree. She's wearing a hoodie and you can even change its color. Cool, right? Edit your Xmas Mockup now. 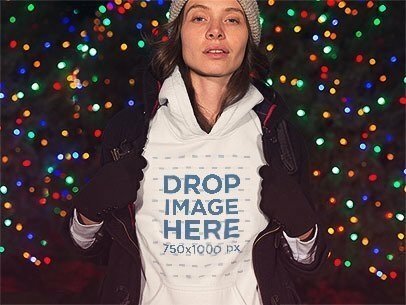 Look at this hoodie mockup featuring a lovely girl wearing a beanie near christmas lights, you can now promote your latest designs for hoodies in a beautiful and photorealistic way. Use the menu on the right to choose a color for this girl's hoodie, then upload your design by dragging and dropping the image over the interface. Easy, right? Try another Pullover Hoodie Mockup here! 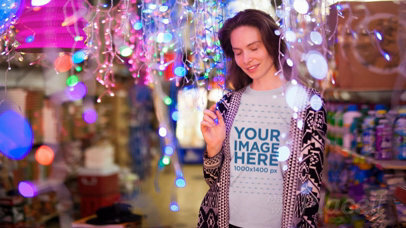 Showcase your Christmas t shirts with an amazing video mockup featuring a pretty woman posing with Christmas lights. Using videos is a great way to improve your marketing campaign, try this one out and start getting more audience and customers this Holiday! Promote your awesome Christmas hoodie design with Placeit's mockups and sell more of your seasonal products! Start now making visuals that will make your customers fall in love with the products you have to offer. Showing your audience a more realistic image of your products is an excellent way to make your audience see what will your hoodies look like in real life. Got an ugly Christmas sweater design? Promote it with Placeit's Christmas Apparel Mockups. They're easy to use, beautiful and perfect for the season. You can even change the sweatshirt's color. This one features a beautiful woman holding her cat at home with Christmas decorations. Try it out, it's easy! Edit your Christmas Sweatshirt Mockup now. Do you want to create a creative marketing campaign for your clothing line for the upcoming Christmas season? 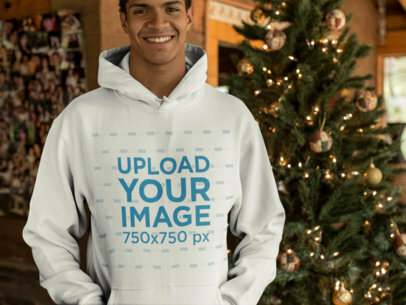 At Placeit you will find professional clothing mockups with Christmas settings like this hoodie mockup featuring a handsome young man posing in front of a Christmas tree. Custom your Christmas hoodie mockup! 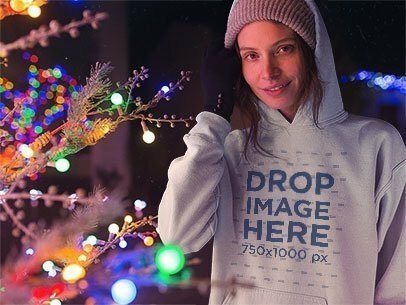 Use this gorgeous visual featuring a lovely woman wearing a hoodie with a jacket in front of christmas lights, you can now promote your latest designs for hoodies through a gorgeous image! Use the menu on the right to choose a color for her hoodie, then drag-and-drop your jpeg or png image file over the interface. After a couple of seconds you'll see the processed image. Try another Pullover Hoodie Mockup here! Take a look at this awesome template featuring a beautiful girl wearing a crew neck sweatshirt and promote your designs in a gorgeous way! Just choose a color for this girl's sweater with the HEX tool on the right, then drag-and-drop your design image file over the upload button on the left. Wasn't that simple? Try another Crewneck Sweatshirt Template! What about a stylish model to showcase your Christmas shirts? 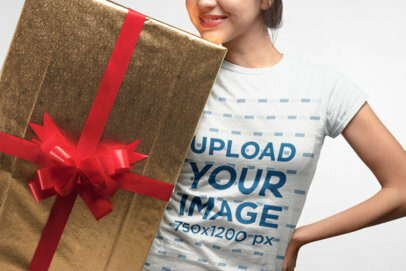 This is a cool mockup to make your t-shirt designs look super fashionable and trendy this Christmas season! Customize the shirt color, add your Christmas shirt design, and that's it! Try it out! 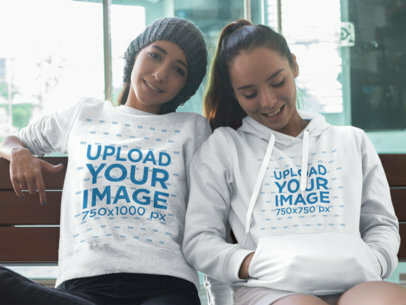 Check out this mockup featuring two young girls sitting down together while they're wearing a pullover hoodie and a crewneck sweatshirt, they have different designs on each! Start using this image now, all you have to do is change each piece of garment's color with the menu on the right, then upload your designs with the menu on the left. Easy, right? Try another Pullover Hoodie Mockup here. Learn about the history of the Ugly Christmas Sweaters and how you can create an Ugly Christmas Sweater design yourself!